Number one-ranked UFC lightweight Khabib ‘The Eagle’ Nurmagomedov – currently training in California for his upcoming fight with Tony Ferguson – has apparently been tested by the United States Anti-Doping Agency (USADA) ahead of the bout. 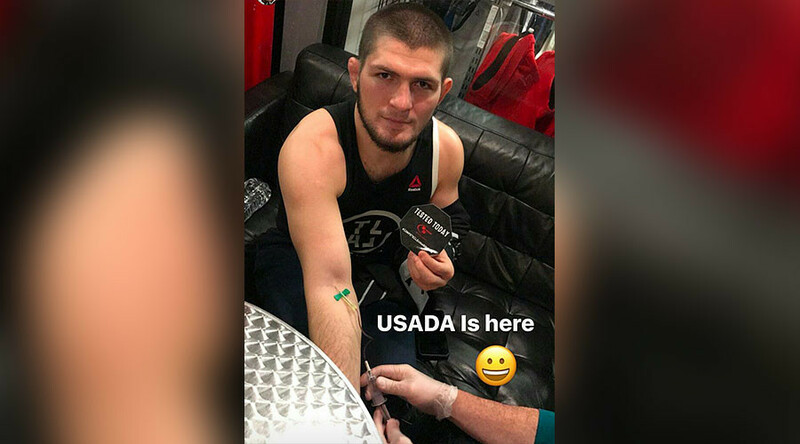 Nurmagomedov, a native of Makhachkala, in the Russian Republic of Dagestan, has posted a picture of the USADA testing confirmation card that says ‘TESTED TODAY’, and shared his thoughts on the organization in the description. Khabib’s younger brother and fellow MMA fighter Abubakar Nurmagomedov, who is now also training in California for his fight in the WSFO (World Series Of Fighting), has posted a picture of ‘The Eagle’ with an intravenous tube in his right arm on his Instagram account. The fight between Khabib Nurmagomedov and Ferguson is scheduled to take a place on March 4 as the co-main event of UFC 209 in Las Vegas, Nevada.